We begin by examining and describing hydrothermal subjects, accepting as context for this discussion that geology is still an inexact science. Geology investigates planet earth and the events of its form and change over millions and millions of years. There are past events that are not yet fully known or fully understood and theories vary but, generally, as knowledge becomes more complete and more precise as time and continued examination proceeds new insights and greater understanding results. In Guatemala, gold deposits are influenced by all the factors listed above. When sufficient concentrations of gold thus created are discovered then exploitation becomes rational. In the case of alluvial gold the most significant of the five factors is the adequate concentration of mineral matter; in this case by secondary and, generally, more recent fluvial processes. The nature of subsurface hydrothermal solutions may be best understood through inference and by analogy with certain types of surface hot springs. This is visible in the form of mineral deposits or as an alteration of associated rock itself. As the word implies, hydrothermal waters are hot with likely temperatures ranging between 50 ° C up to 500 ° C. The higher temperatures, found at greater depth, also exhibit elevated pressure. In Guatemala, deposits offering hydrothermal insight are generally found in locations more than 1,500 meters above sea level in western portions of the country near Huehuetenango or San Marcos, but also in the Departments of El Quiché, Alta Verapaz, and Baja Verapaz. Some few others, as well, may be found in the east near Chiquimula, where higher elevations are also found. The movement of hydrothermal solutions from source to ultimate place of deposition depends largely on the pathways and conditions that exist in the surrounding rock. Deposition of significant quantities of economically desirable minerals requires a continuous supply of hydrothermal solutions migrating through a porous or fractured medium. Openings have to be interconnected and cavity filling deposits can not be formed unless there are cavities to be filled. It is similarly apparent that substitution deposits can not form unless appropriate solutions reach rock where other material has been previously removed by other chemical or mechanical action. Openings in the rock are essential for epigenetic deposit formation; just as they are for the development of groundwater bodies, or hydrocarbon reservoirs. Different types of open space in rocks can serve as receptacles for minerals or allow replacement of initial constituents by the ongoing movement of solutions through the rock. The tiny spaces between the atoms of a crystal can allow diffusion and incorporation of ions of smaller ionic radius. 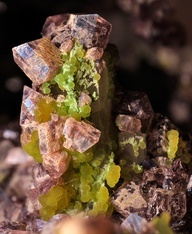 This diffusion facilitates substitution or additions within crystals such as that which can occur in quartz or feldspar. This phenomenon is known to occur in the mountainous region of El Chol, Baja Verapaz where, for example, feldspar associated with quartzitic rock, is mined for material useful in the production of ceramic glazed products like toilets, tubs and sinks. These are formed when molten lava, surrounded by and enclosed in cooler and more rigid lava, continues to flow creating a tube, tunnel, or similar void. These fractures form by contraction as igneous rock cools and shrinks slightly in volume. Such fractures may be regularly spaced joints that divide the rock into blocks, as layers separated by smooth parallel fractures, or as irregular, seemingly random cracks. Associated voids and joints in volcanic breccia and sediments. Breccias are composed of thick, angular fragments of igneous rocks with fine materials in the interstices. These interstices may be highly permeable. These are well-known features of all sedimentary formations. 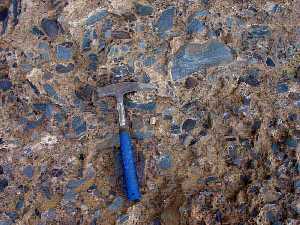 Such stratification or bedding enables the entry of hydrothermal solutions and the substitution or deposition of mineral ores within or between layers. Fissures are continuous tabular openings in rocks, frequently of considerable length and depth. These originate from forces of compression, tension or torque acting on the rocks and may or may not be accompanied by displacement across a fault. That is to say that while faults with displacement are important types of fissures in rock material, not all fissures represent this type of failure. Non-fault fissures can provide long continuous lines for the movement of solutions. When they are occupied by metal or mineral these fissure concentrations or “veins” may have value. Where fracturing occurs more broadly and across shear zones, rather than concentrated in one or two individual tears, crushing causes innumerable smaller and shorter cracks. While discontinuous they are closely spaced, and more or less parallel. Frequently faults are also present and the “openings” though mostly of small size, are dendritic in overall pattern. These are excellent conduits for solutions, as evidenced by actual streams that flow through them in places where they enlarge to form tunnels or where mines shafts penetrate them. Because of the tiny apertures, there is less depositional open space, but due to the large surface area of the great number of such cracks within a shear zone they can offer a favorable location for mineral deposition. The bending and folding of sedimentary layers give rise to fractures in a variety of settings. They occur in the ridge crests of tightly folded anticlines, in steeply dipping beds of both anticlinal and synclinal structures, and even where tensional forces stretch largely horizontal layers during subsidence. Fracturing and the creation of conduits for hydrothermal movement of water is not only vertical but may occur longitudinally as well, offering migration possibilities in vector directions from structural trends.